As a small business owner, you may be at the stage where you are thinking about expanding your business. It’s a huge decision! There’s the old saying “if it ain’t broke, don’t fix it”! If things are going well as they are, and you are increasingly able to blend the needs of the business into your busy lifestyle, do you really want the stress and hassle of change? On the other hand, if your business is at the point where you have the opportunity to expand and grow, then surely this has got to be a good investment for the future? Perfect Spice is a popular takeaway restaurant in Acton, West London, specialising in Indian and Chinese foods run by Abu Sadik Mohammad Maruf. Abu wanted to boost advertising through leaflets during the 2014 Christmas period, which traditionally brings a peak in Indian takeaway sales, and came to Fair Business Loans for funding for small business. The loan enabled him to expand his marketing efforts and he saw a steady increase in sales over the busy Christmas and New Year period. As we approach the festive season once again, is it the perfect time for you to expand your business accordingly? 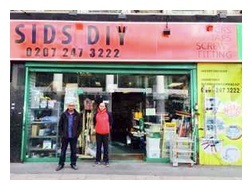 Sid’s DIY is a DIY store that started with one shop in 2011 and opened another in 2014. The owner - Sid Balbinder - approached Fair Business Loans for a small business loan to help increase his stock level, buy better quality of stock and new key cutting machines. The key cutting was a particular opportunity for the local market, and Sid also realised that stock levels needed to be higher at both stores in order to provide customers with the excellent quality of service he was aiming for. Fair Business Loans were happy to provide the small business funding that Sid needed, and are pleased to see the business going from strength to strength. Is it time for you to invest in new, better quality equipment or increased levels of stock? Make A Wish Parties is the brainchild of Francesca Appleby. It is a children’s entertainment company, with motto is “no event is too big or too small for us”. The company provides a range of services including chocolate fountains, candy buffets, bouncy castle hire, clown school, children’s photographer and Christmas entertainment. Francesca started the business 7 years ago and recently came to us for a small business loan that would enable her to reach a wider audience. The loan has enabled Francesca to buy new equipment and make her website stronger, improving her client base - and ultimately keeping more children happy! So, these are three very different businesses but all are people just like you who have gone through that same decision process but have gone about it in different ways. Each with one thing in common: they have been helped to grow their business by receiving small business funding from Fair Business Loans. Why not get in touch today to see how we can help YOU grow your business!